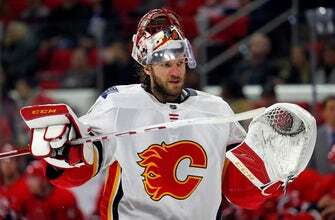 BUFFALO, N.Y. (AP) Calgary Flames goalie Mike Smith is encouraged but says it’s premature to determine when he’ll be cleared to play after practicing with the team for the first time in nearly a month since sustaining a lower body injury. Smith spoke after traveling from Calgary to join the Flames in Buffalo on Tuesday, a day before they play the Sabres. He’s been out since being hurt in the final seconds of a 3-2 win at the New York Islanders on Feb. 11. The 12-year veteran has a 23-16-6 record in his first season with Calgary since being acquired in a trade with Arizona in June. The Flames have slipped out of playoff contention by going 3-6-2 and allowing 40 goals in 11 games since Smith was hurt. Calgary began the day 11th in the Western Conference standings with 74 points, and just three behind the eighth-place Los Angeles Kings.